Each of these designations has its own set of specific standards and/or requirements. To be listed in our directory and access our member benefits, you must join Yoga Alliance and maintain your membership to retain any of these designations. Yoga Alliance utilizes Social Credentialing for its RYSs and YACEPs. Registered Yoga Teachers provide feedback to RYSs and/or YACEPs by completing a review. This feedback helps the RYSs and YACEPs continually improve their trainings and courses. See designations below for eligibility requirements. Yoga teachers who complete a 200- or 500-hour teacher training at a RYS may apply for registration and use of the RYT credential, provided their training and teaching experience meet our requirements. The RYS designation is available to schools with a teacher training taught by qualified instructors and a curriculum meeting or exceeding our Standards. * This designation cannot be a standalone credential; you must have either a RYS 200 or RYS 500 if you want to add the RYS 300 designation. 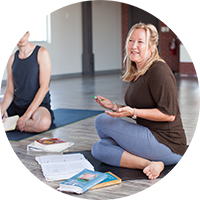 The YACEP designation is designed for experts in the yoga community to set themselves apart and teach courses that qualify as Continuing Education hours for RYTs. * We are introducing the YACEP designation in phases. At this time, the designation is only open to E-RYTs.